The decision by South Korea’s financial authority to suspend trading of Samsung BioLogics shares on the stock market last week not only deals a blow to the biotech company but also puts the brakes on a high-profile succession scheme for the conglomerate, controlled by descendants of the founder, industry watchers said Sunday. On Wednesday, the Financial Services Commission concluded that Samsung BioLogics had “arbitrarily interpreted the accounting rules and intentionally breached them in 2015.” Moreover, the financial authority will review when to lift the suspension, or whether to delist the biotech firm from the market index, according to officials. Making matters worse, the FSC’s conclusion has sparked calls to reinvestigate a controversial merger between Cheil Industries and the former Samsung C&T, viewed as a way of passing the baton from the ailing Chairman Lee Kun-hee to his only son, Vice Chairman Lee Jae-yong. Samsung C&T is the largest shareholder of Samsung BioLogics with a 43.4 percent stake. Lee Jae-yong is the largest shareholder in Samsung C&T with a 17.08 percent stake. Lee became the largest shareholder of Samsung C&T after the 2015 merger that incorporated the two affiliates via a share swap ratio of 1:0.35. It was viewed widely as favorable to Lee, who was then the largest shareholder of Cheil Industries. The merger was blamed for inflicting losses on investors of the former Samsung C&T, including US activist hedge fund Elliott, which brought the case to court but lost trials. “Samsung’s ultimate goal was to have Samsung C&T acquire Samsung Life Insurance’s stake in Samsung Electronics by using funds from Samsung BioLogics,” said Park Ju-gun, head of market watcher CEO Score. The Samsung BioLogics scandal increases the complexity of the entire inheritance and governance restructuring scheme of Samsung as the National Assembly is planning to enact a revised insurance law that limits a nonfinancial company’s stake in a financial unit to 3 percent. If the parliament passes the bill, Samsung Life has to sell off at least 4.93 percent of its 7.93 percent stake -- which is estimated to be around 15 trillion won -- in Samsung Electronics. According to market rumors, a likely scenario would be to have Samsung C&T purchase 4 to 5 percent of that stake by using funds from BioLogics to help reinforce Lee’s dominance over the electronics unit. Such a method would be a classic version of a chaebol succession scenario, said Lee Byung-tae, a business management professor at the Korea Advanced Institute of Technology, as they find it difficult to keep family control in a country that imposes a high tax rate of 65 percent on inherited assets and has tight regulations over cross-shareholding governance structures. “If there was no pressure from the government and political circles, Lee’s succession process (would surely) have been completed,” Lee said. “As seen in the Samsung BioLogics case, mobilizing affiliates is a common way of securing funds and resources for a stable leadership position, although it is viewed as an expedient,” the professor said. 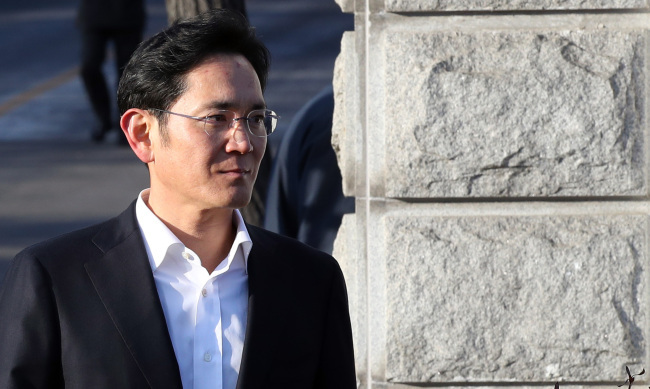 The Samsung BioLogics case, however, is not strictly related to Lee’s succession scheme, as the heir taking the control over Samsung as the leader of the organization, not necessarily by securing enough shares, was completed before the alleged accounting fraud took place. “Logically, the bio unit’s accounting fraud is not related to Lee’s succession and it is just a matter of accountancy. But the issue (of linking the case with Lee’s inheritance) is only a claim by activists (who call for transparency in corporate governance),” the professor said. Samsung, for its part, denied the link between the case and Lee’s leadership succession, saying such claims by experts and politicians are fiction.” However, officials at the conglomerate fear that the FSC’s conclusion that Samsung BioLogics arbitrarily interpreted accounting rules could affect Lee’s remaining trial and further raise controversy over inheritance issues.